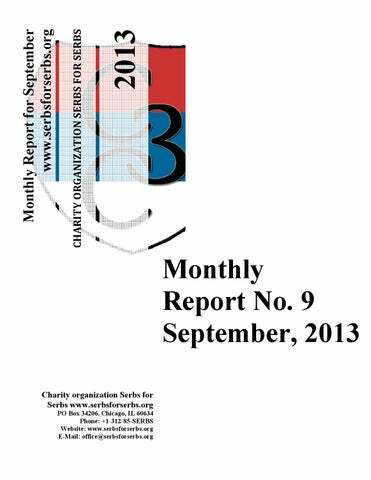 Monthly Report for September Dear friends and donors, Charity organization Serbs for Serbs registered in the state of Illinois in United States in Jun 2010 by the group of the Serbian youth. Charity organization Serbs for Serbs is a 501(c)(3) notfor-profit profit charitable organization. Donation is tax-deductible deductible to the extent followed by the law. On 30th September, 2011 we finally nally got the letter from department of the treasury (IRS) with tax exempt 501(c)3 approval. All donations to our organization donated from June 16, 2010 are tax deductible under section 170 of the Code. We are also qualified to receive tax deductible bequests, devises, transfers ansfers of gifts under section 2055, 2106 or 2522 of the Code. www.serbsforserbs.org 2013 the population and generally bad economic condition of the households in Serbia, Republic of Srpska and other countries in the Balkan. An average couple has "fallen" on one child. Analysts warn that Serbs will become a minority in its own country in the following century if the nation, individuals and government don't wake up from the nescient in which they've fallen! On the other hand, nobody is talking about the families with many children which grieve by living in bitter poverty. Occupied by their everyday struggle for survival, they are being humbly in their desire for implementing rights which belong to them. Their life stories, fears and problems are identical, but almost invisible and unheard in order to gain the attention of the public, media and even state. That's why the idea of the Charity organization Serbs for Serbs arose. The organization rganization was formed by a group gr of young and trustful people, who are united by the common vision of helping families blessed by many children and who are aware of the fact that even a small help means a lot for those who don't live in a material excess. We are united by the humane idea to help the poorest part of the Serbian nation. Charity organization Serbs for Serbs try to revive the spiritless energy of the Serbian Diaspora which would be able to reinforce people of Serbian heritage as well as all good people throughout the world with minimal, but bu constant monthly donations. We hope and believe that there is also a grain of doing good and that you will join us in the endless e struggle against poverty. God bless and save all Serbian families with many children and our honored donors who participate in the noble effort to return smile on children faces. CHILDREN ARE E OUR FUTURE! We hope that the bathroom will be finished until the beginning of winter, before the snow. Charity organization Serbs for Serbs helped a twelvemember family Vujevic from the village Gornji Lokanj near Zvornik. The family needs help in building a house floor, so that the children could get their rooms. Charity organization Serbs for Serbs bought a construction material in the amount of 320 KM, and provided 600 KM for the artisan. On the last official weekend of summer and at the last official summer event, the Chicago branch of Serbs for Serbs attended the Labor Day Picnic at Nova Gracanica Monastery. With wonderful weather and a good turn-out, we were able to collect $837 for the Antic family. The day was also marked by an amazing performance by the Folklore ensemble 14. Oktobar visiting from Krusevac. Again, we met many new people and ran into old friends, but more and more, we are having people tell us that they are already following our charity work online and are familiar with our projects. This was clearly apparent with over 280,000 visits to our Serbian and English web sites last month!! We will continue to do all we can to help as many families as possible. Once again, thank you to everyone that visited our booth and thank you to everyone that was able to make a donation! www.serbsforserbs.org 2013 The family moved in during several days. All the things well preserved, and suitable for the future usage have been moved. Charity organization Serbs for Serbs, with the help of its donors and friends, managed to carry through another big project in 2013 â&#x20AC;&#x201C; moving a six-member family Antic into a new home, in Golemo selo near Vranje. After many years spent in an object which is falling apart, family, and above all, the youngest members, can live in a new home without fear that the roof might come down, or that the fire could destroy what is left of their home. The old house in which the family lived is unfortunately only one of tens of thousands other houses in which children live and grow up. Miljana (16), Aleksandar (15), Stefana (8) and Dimitrije (6) carried their things and left their old house forever. Regardless of the new house, the family will keep in its ownership several acres of fertile land and forest, which it will continue to use. Thanks to Novica Cvetkovic, a friend of the organization who provided logistics, Dusan Djordjevic, a journalist who commenced the action of help through his texts, and Bosko Ljubic, an owner of the house, the family was warmly welcomed into its new home. Charity organization Serbs for Serbs will continue to pay the rest of the installments, and within a month the documentation should be in the hands of the family. The house and the estate can't be sold in the next period. After paying out the house, we will try to provide agricultural machinery, and household appliances for a normal and decent life. Charity organization Serbs for Serbs provided at the end of April this year a construction material to the fivemember family Pudar from the village Bun near Mostar, in the amount of 2.500 EUR for finishing the house. That was the first installment of the planned help within the big project of our organization in cooperation with the Charity Association Dobrotvor from Mostar, which will continue in 2013, in the value of EUR 1.500. Representatives of the Charity organization Serbs for Serbs visited during the previous weekend family Lucic from Cacak, consisting of a single mother Sladjana and five children: Stefan (18), Aleksandra (15), Jovana (10), Bosiljka (9) and the youngest Dusan (2). We have already visited the family earlier, and before this visit we provided 35.100 dinars for the school equipment and firewood. www.serbsforserbs.org 2013 The house in which the family lives is located outside the village. They need a bathroom, which was settled in an object near the house, which is collapsing. There are water pipes at the location of the future bathroom, but some construction works outside the house need to be conducted. Representatives of the Charity organization Serbs for Serbs from Novi Sad, and the Ravnica Srpska Association from Subotica visited in September family Pejic from Gornji Tavankut near Subotica. Family Pajic is a refugee one, and it came from Bjelovar after the war in Croatia. The family consists of father Stevan (57), mother Milena (48), daughter Milica (24), sons Slobodan (22), Miroslav (20) and Nemanja (18). The sons work for a wage, usually on the nearby farms. The winter represents the worst period for them. The oldest son has a wife and a child, but due to poor life conditions, they live in Belgrade, at his wife's parents. During the conversation with the members of the family, we came to a conclusion that the family would like to grow strawberries on the piece of land they own. They could sell the fruit in the village, which is being exported to Russia. The investment doesn't cost that much, because they already have a well and a water pump, and they need foil and drip irrigation system. Members and friends of the Charity organization Serbs for Serbs from Belgrade visited at the end of August family Lazovic from the village Banja near Zubin Potok on Kosovo and Metohija. The family consists of mother Valentina and three children: Bojan (12), Tamara (5) and Tijana (3). The neighbor who is employing Stevan is willing to help them with the strawberries, plant protection products and mechanization. The land for the strawberries was a neglected land, because they only grew a garden near the house. Pejics told us they spend all the money they earn during the season on winter, so they weren't able to provide seed. The Ravnica Srpska Association wishes to get involved into the project, and provide everything necessary for the beginning of growing strawberries since March 2014. Their income consists of the family retirement left from the husband and father who died at the beginning of year in the amount of 18.000 dinars. We call upon all the donors and friends of the organization worldwide to support this and future projects of our organization by DONATING. The family lives in a house which was finished while the father was alive on the outside, but the inside of the house has many deficiencies. They need bathroom tiles and sanitaria in the bathroom. We call upon all the donors, friends and people of good will to contribute, in order to make the living conditions of the family Lazovic better, and make easier the growing of Bojan, Tamara and Tijana. This charity organization, comprised of young and energetic people, is raising money for the large Serbian families, not only on Kosovo and Metohija, but across Balkan, wherever there are endangered Serbs. Although most of its members are abroad, far away from their home, they are together with their brothers in trouble. Our brothers from the Charity organization Serbs for Serbs once again helped us and our project of the goat farm, and donated money for the furniture and appliances for the room in which the caretaker will spend his time. This is not the first time the SFS is helping the work of our organization and the families in any kind of help. Within the large social project, commenced by Mrs. Marija Milada from Munich for helping a single mother Zorica Pecirep, members of the Charity action Serbs for Serbs from Canada joined this action and provided over $8.500 for buying new home. Zorica Pecirep until recently lived in a deserted barrack without water, electricity and elementary living conditions with four children, Miodrag (17), Violeta (16), Vladimir (14) and Nikolina (11). The Center for social benefit provided two meters of firewood last winter, but it wasn't enough so Zorica was forced to collect branches with the help of neighbors. Mother Zorica with their children in old barrack Family Susko ceded a barrack to Zorica, without the obligation to pay a rent. The authorities decided to demolish the barrack, and the utility shut down the water over three years ago, because the family Pecirep couldn't pay the bills, so Zorica was forced to bring the water from a public fountain. The help Zorica is receiving amounts 125 KM. The oldest son Vladimir collects copper and iron. Also, Zorica sometimes cleans other houses for 20 KM, but that is not sufficient for a sack of flour. After an appeal in the media to provide the necessary humanitarian aid for the Pecirep family, Mrs. Marija Milada from Munich, originating from Rogatica (Republic of Srpska), came to visit the family, and started collecting donations for buying a house near Visegrad that could suffice the needs of children. With the promise of the city and municipality authorities to contribute if the necessary means are being collected, members of the Charity organization Serbs for Serbs and Serbian Network from Canada decided to provide the remaining means and thus resolve the housing problem of the family. After several successful charity actions in Canada, the money was quickly provided, and sent to the account of the organization Serbs for Serbs in the Republic of Srpska, which paid the seller. The remaining money was provided by the Serbian cultural-artistic societies in Germany and a vast number of the individual donors from Germany and other countries. The total price of the house was 17.000 KM (approximately EUR 8.500), which was paid during August. After that, the house was officially transferred to Zorica, and during September the municipality provided the necessary works in the house. The seller left the furniture in the house, the kitchen, wood-burning stove, TV and 7 meters of firewood for the winter. Unfortunately, the family still has several problems. The mother and the oldest son are ill, and therefore they can't find permanent job. Municipality Visegrad promised to provide 300 KM of social benefit, which will be enough for the elementary needs. We call upon all the friends and donors of the organization worldwide to support the work of our organization in order to help the Serbian people, families, and above all, the endangered children. Report: Diocese of Raska-Prizren and Kosovo-Metohija Feast of the Nativity of Holy Mother of God (Nativity) was celebrated on September 20th in Gracanica monastery, where the Bishop of Raska-Prizren and Kosovo-Metohija Teodosije served the Holy Liturgy. After the Liturgy, the Bishop blessed and broke the slava cake, because it was a festivity by the Eparchy Charity Organization “Majka devet Jugovica”. After the Liturgy and the award, the Bishop consecrated a newly built goat farm in the village Prekovce, which should enable the sustainable work of 6 public kitchens led by “Majka devet Jugovica”. The Bishop expressed gratitude to all the donors who enabled the realization of this project. 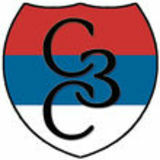 The project of farm was supported by the Humanitarian Fund B92, charity organization of the Serbian students in Switzerland headed by Mr. Milan Kisic, Charity organization Serbs for Serbs from Belgrade, the fans of Red Star, „Delije“, Zaduzbina of Slovenia and others who are regularly helping the charity projects of the Eparchy. Within the goat farm in Prekovac, a new object with 180 goats was built, and the goat cheese will be produced for the supporting the public kitchens. On this occasion, Bishop Teodosije awarded to Svetlana Stevic, the president of the Organization, high decoration of the Serbian Orthodox Church - the Order of Empress Milica – Mother Eugenia, for the dedication and work in the Organization and management of public kitchens and other charity activities on the territory of the Diocese of Raska-Prizren. www.serbsforserbs.org 2013 The runners-up were: Miroslav Becic (14 shots) and Nebojsa Jankovic (11 shots). The sponsors of the tournament were utility „Trznica“ from Novi Sad (15.000 dinars), restaurant Zelena oaza (dinner for the winners), wellness center of Park hotel (the usage of its services for the winners), and the friends of the organization from „Mama Zaga“ and „Agi Pasta Way“ who prepared food for the participants and the guests. The participants contributed to the donations by 32.400 dinars and EUR 30, which will be used for building a bathroom for the refugee family Pajic from Gornji Tavankut near Subotica. President of SFS Igor Rasula with David Bracevic, winner of tournament „Trojka iz bloka“ Novi Sad Charity organization Serbs for Serbs in cooperation with the Basketball Federation of Serbia has successfully organized a charity 3-point tournament „Trojka iz bloka“, which was held for the first time in Novi Sad on Sunday, September 29, in the elementary school Kosta Trifkovic. Over 60 participant fought for the trophy, and the best shooter was David Bracevic who scored 16 three-pointers. During 2013, we collected over 1.000.000 dinars in Belgrade, Chicago, Kragujevac and Novi Sad. This sport manifestation continues in Subotica, in cooperation with the Association Ravnica Srpska. President of the organization Serbs for Serbs Igor Rasula was very satisfied by the fact that it was the first time to organize such a huge action in Novi Sad, which has a goal of promoting the charity work through sport, and at the same time, collecting the means for building a bathroom for large families in Serbia. He expressed the hope that on the next occasion, a greater number of people from Novi Sad will come and provide the brighter future for the youngest in Serbia. The project â&#x20AC;&#x17E;Trojka iz blokaâ&#x20AC;&#x153; was supported by famous Serbian basketball players Dejan Tomasevic, Dejan Bodiroga, Rasko Katic, Novica Velickovic, Vuk Radivojevic, journalists Vanja Bulic, Slobodan Sarenac, Ivan Ivanovic, volleyball players Tomislav Dokic, Dragan Stankovic, Nikola Rosic, rapper Bosko Cirkovic Skabo and also other sportsmen and musicians.